As I think a lot of us have noticed, there are almost two lines of bloomfield cpus, with the two main batches (a&b) differing greatly in the vcore needed to achieve an oc. So to all core i7 owners, please respond to this thread with your batch #, a screenshot of cpu-z, realtemp or coretemp, and prime95 on small fft showing your load temps, and what cooling you are using. There is a good deal of variation among core i7 chips with load temps and voltages, and its interesting to see the correlation with the batch #s.
For those that don't know, the batch # can be found on the retail box, on the bottom of the sticker, under the label of FPO/Batch #. If this thread gets a large enough sample of batches, I will post up a chart of the varying results. Last edited by cky2k6; 02-02-2009 at 01:54 PM. I'll be nr 2 then. Aircooled by a Thermalright Ultra Extreme. Date must be 03/01/2009 of course! Is that my new CPU nilos You already on the Giga Extreme version now ? That's a great chip! I haven't been able to boot higher than 3.8GHz on my "A" batch, at least below 1.33v although I haven't had time to mess with it though. come on guys, lets keep this going. The rest is in my sig. Last edited by dengyong; 01-15-2009 at 04:11 PM. Cooled by handmade copper waterblock. I have an i7-920 batch 3841A507 and will let you guys know what it does on air with a TRUE when I get a mobo and some RAM to run with it. 4.0ghz (20x200 turbo off) @ 1.40625v bios, 1.360v load with HT on, 1.375v QPI, 8-8-8-21-1T, 1.65v DRAM (1.66 BIOS), max LinX temp 83c on TRUE 120 push-pull. 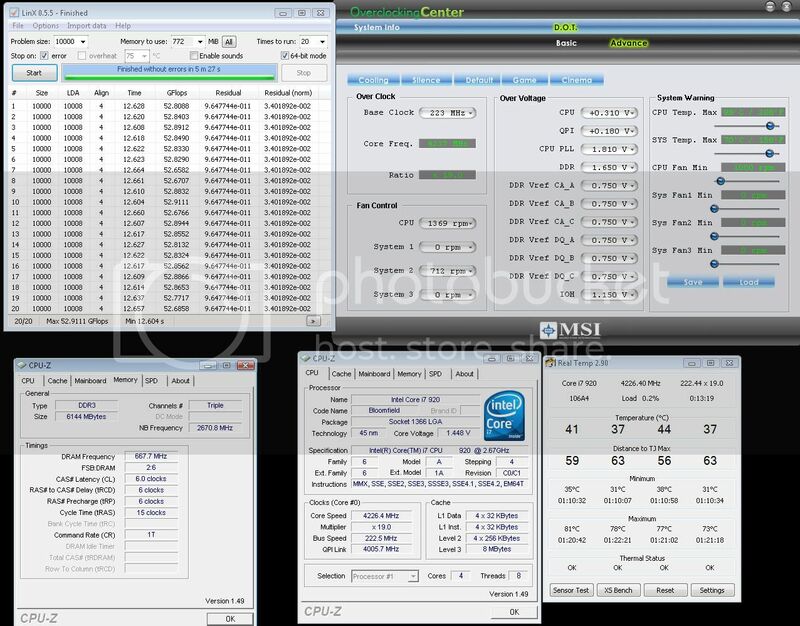 3.8ghz (19x200 turbo off) @ 1.21875 bios, 1.184v load, 1.20v idle, HT enabled, 1.275v QPI, 8-8-8-21-1T, 1.65v DRAM (1.66 BIOS), max LinX temp 63c on TRUE 120 push-pull. I got HT disabled down to 1.154v load I think for LinX but I had to bump it all the way back up to 1.184v for Prime blend even with HT off. Higher voltages were required for Prime blend stability vs LinX x 20 even though LinX has highest temps. I think this is due to memory system load because I had to increase vQPI a bit for HT as you can see. Last edited by Bullu$; 01-12-2009 at 04:40 AM. 3837A715 here, under the stock cooler @1.352v under stress, 1.094 idle. My mobo is the EVGA X58 TRI-SLI with the original bios. I'm having a very hard time overclocking this thing, uncore and QPI multipliers are on minimum and I still get instant bluescreen at 3.7ghz. Mem is 3x G.Skill DDR3-1333 CL9, but it won't work if I set it to multi's so that they're running DDR3-1375 at 1.65v (stock is 1.5). I updated the bios to the newest one, and got the mem running at 1372mhz CL9. Still no go about reaching past 3.7ghz, waiting for a new cooler. Last edited by joger; 01-12-2009 at 05:41 PM. Needs 1,304V for 4Ghz and around 1,38 for 4,2, haven't tried that one really hard yet. Likes 21x and 23x mult equally well and hates the 22x. To all the people using IntelBurnTest on i7 with HT on: It's pretty useless as it only loads up half the cores, use eitehr prime blend or LinX for now. So can we confirm that the earlier the batch the better ? the trend is getting clearer. And even multies are i7's enemies. Btw, that is on cascade, I wonder if it can hold 4.4Ghz w/ HT=on using water cooling. Temps are pretty bad under load (CPU gets way into positive range) so yeah, I guess my chip could do 4,4 with HT on on high end water as well. Although I am sure IBT will be adapted soon enough. Yahh jcool I was referring to you. Are you sure linX is using all cores/100% CPU on i7 ? BTW, what is the earliest Retail i920 (wee/batch), so far I have seen week 35 ? We need apples to apples comparisons for load testing. I am using less voltage for LinX vs Prime blend, every single time. Edit: I'm making another post on the subject of comparisons and I also think I found out why I saw this strange behavior. I think I needed a slight vCore bump for Prime blend only because I was running specifically @ 20 x 200 with the settings I had. Honestly I can't even say for sure that I needed it at all but it was the last change I made and it passed the test, could have just been luck. I made this post when I had just started learning what the hell I was doing. Last edited by JWMc; 01-31-2009 at 08:57 AM.